I always love reading about what programs other homeschool families use. Sometimes what one person likes you recognize is exactly what you don't like, or what is a disaster for one kid is exactly what another kid needs. I never get tired of that beautiful diversity! This year my little fella will be a big Third Grader. I can hardly believe he's 8 years old. I distinctly remember my third grade year and the public school in Florida that I went to for part of the year. It's wild to think that my "baby" could have such clear memories of this time frame when he is all grown up. Miss M is having a sort of second year of 6th grade. Although she did 6th grade level work across the board last year, I am in no rush to have her start junior high (and high school right around the corner from that). She's only 11! So this year she will be advancing in her studies, but we're still calling it 6th grade. Some of her work will be at a 6th grade level and some will be a good deal beyond 6th. 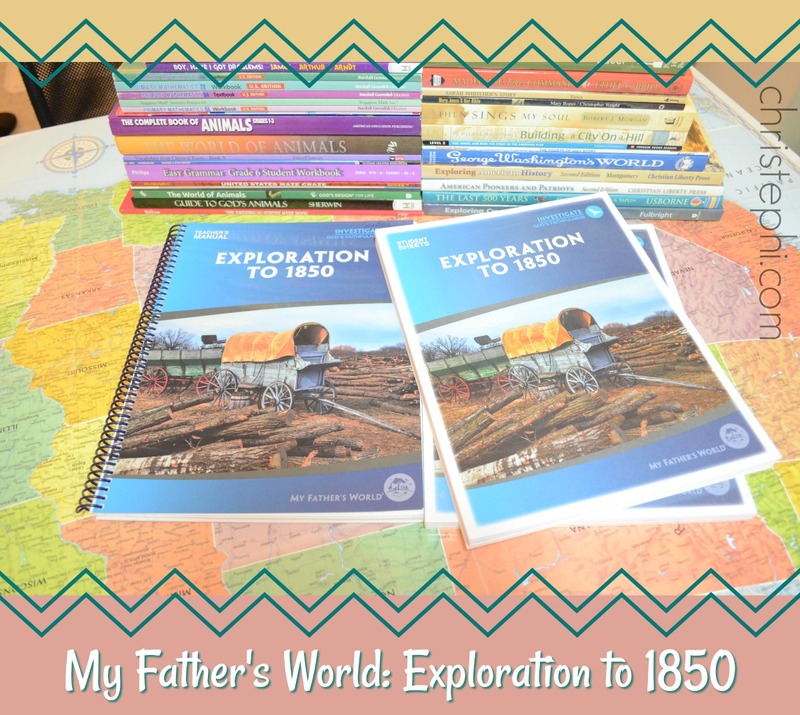 We will be continuing with My Father's World for the sixth year; this year will be Exploration to 1850, a study of early American history from colonial times to the California Gold Rush all set in a framework of world history. This study will be different than our past two years since so much more of it will be closer to home -- Lewis and Clark, the Oregon Trail, Native Americans, steamboats, etc. 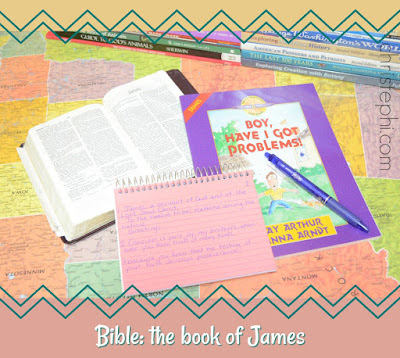 In Bible we will be studying and memorizing the book of James. Yes, the plan is to memorize the entire book! I have been looking forward to this for years. 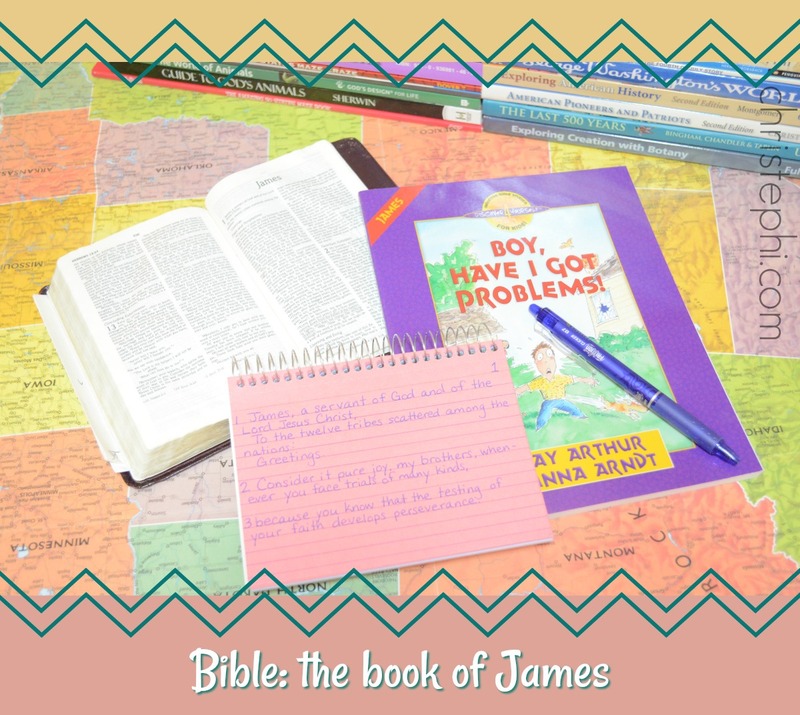 I memorized James in my 7th grade Bible class umpteen years ago and still retain a fair portion, so I'm hoping that my enthusiasm and ability to memorize along with the kids will be enough impetus to keep us going successfully all year. For science we will start off the year with a study of zoology including the basics of taxonomy, something my kids have not yet encountered; and we'll finish out the year with Apologia's elementary botany course. 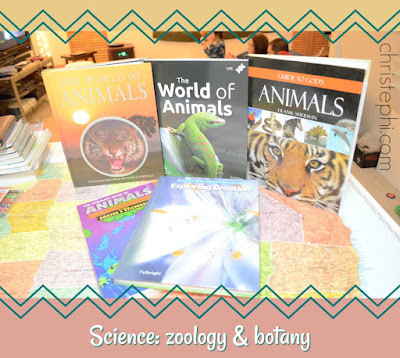 I have always loved animals and green growing things, so I'm enthusiastic about these topics. Miss M, on the other hand, confided in me this evening that both of them seem boring. Here's hoping we can win her over as we go along. I think she was exceedingly wowed by last year's astronomy study and it's many, many experiments. 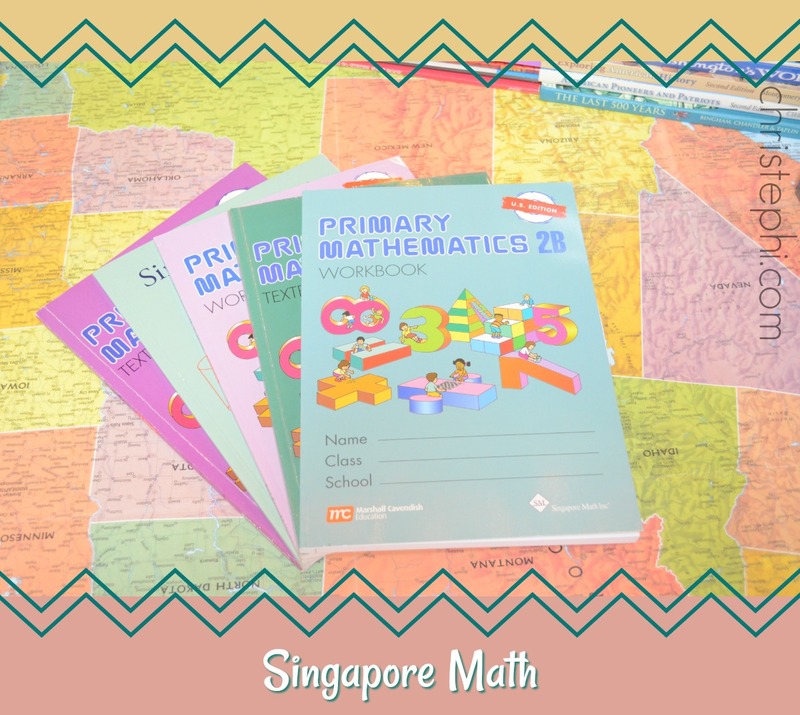 Mister E will proceed into level 2B in Singapore Math and should make it most of the way through 3A by the end of the year. I'm only having him do math 4 days a week, not 5, so he won't quite finish both levels by the end of the year. 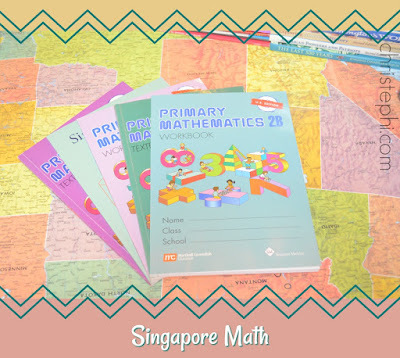 Miss M will linger over Singapore Math 6A using the Intensive Practice book in addition to the regular textbook and workbook, and then take a quick survey of 6B before the end of the year. I'm more concerned with her practicing word problems and critical thinking than I am about the pre-algebra-like content of these levels since she'll get pre-algebra next year anyway. 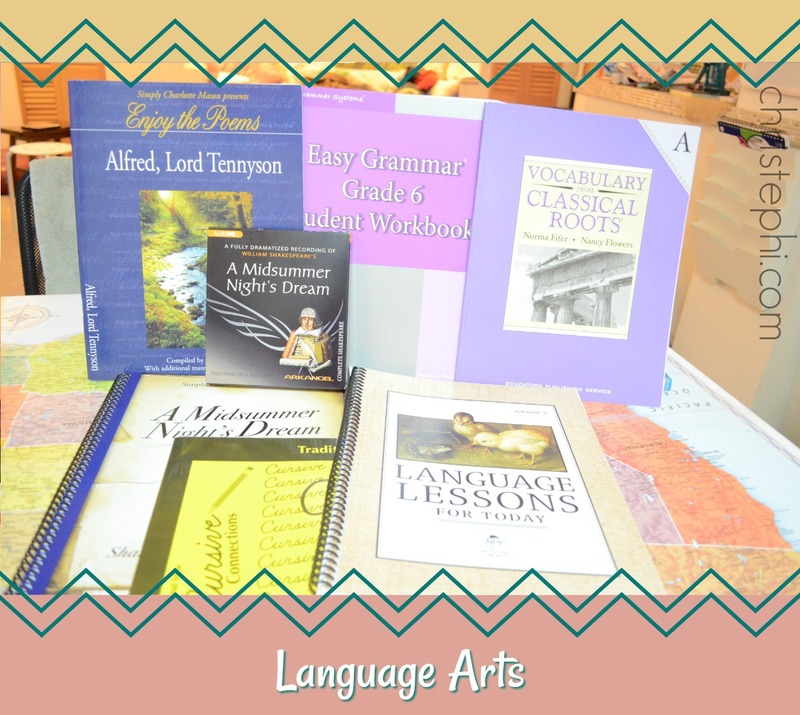 English language arts will be fun this year! We're starting out doing Simply Charlotte Mason's Shakespeare in Three Steps: A Midsummer Night's Dream. 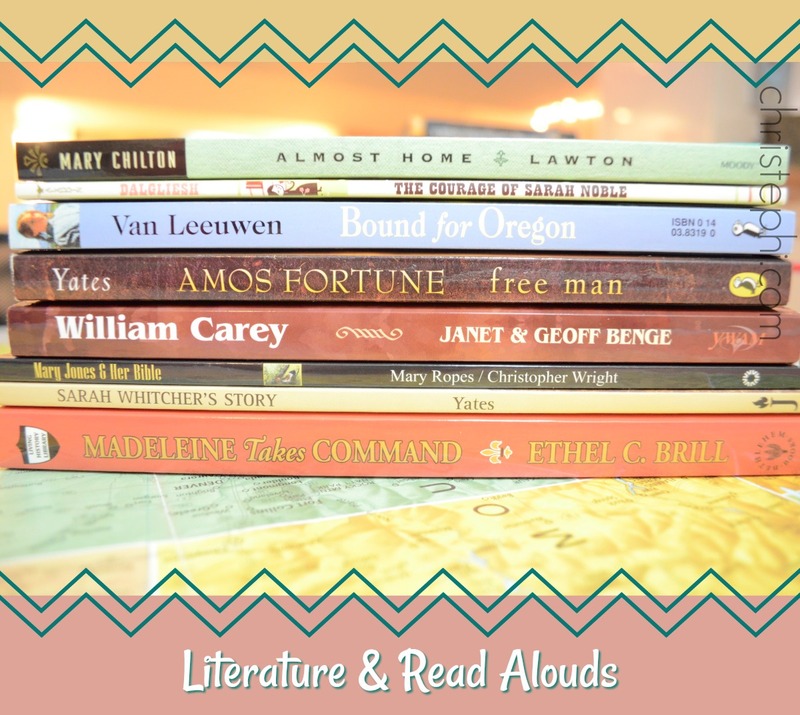 Both kids will participate in reading, listening to, and then watching the play. Miss M will also copy and memorize some of her favorite passages. Once that study is complete, Miss M will study Alfred, Lord Tennyson. Throughout the year she will dive more deeply into English grammar than she ever has before using Easy Grammar Grade 6, while Mister E takes a gentle survey of grammar using Language Lessons for Today Grade 3. 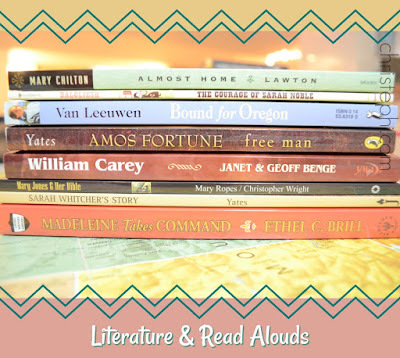 Between the two kids, we've got quite a stack of literature books and read-alouds to get through. Miss M is rounding out her language arts study with Vocabulary from Classical Roots Book A (Grade 7) and Writing Strands 5. 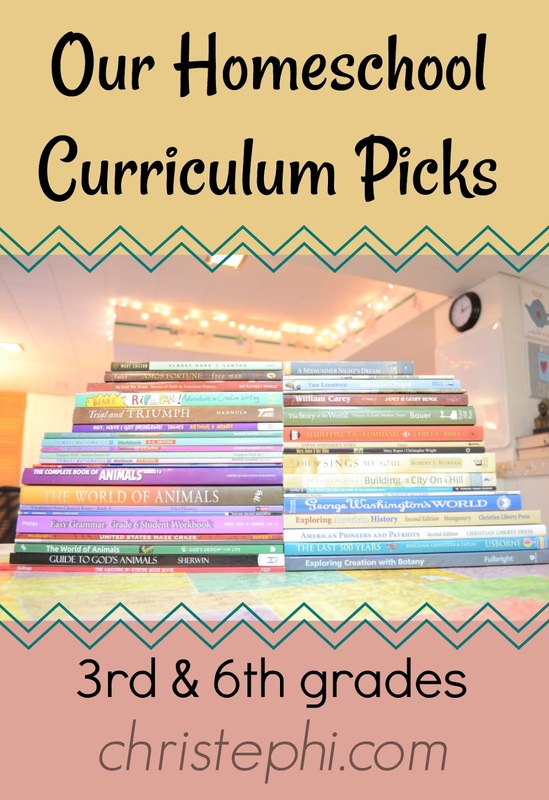 Mister E will complete a study of cursive using the now out-of-print Cursive Connections. Neither child is using a formal spelling curriculum again this year. So far they are both natural spellers and any spelling needs are addressed as they come up with excellent results. 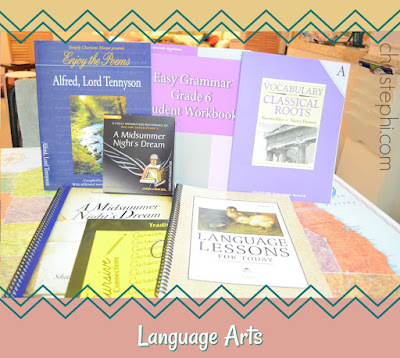 Miss M used Easy Peasy's 6th grade Spanish course last year and enjoyed it, so she will be continuing with 7th Level Spanish this year. Mister E begged me to let him study Japanese this year. I'm a bit hesitant about it because I can't really help him, but I grabbed him some workbooks (this and this) to get him started and will let him pursue that study informally during his own time. My Father's World schedules lessons from God and the History of Art for all four years of their history cycle. We've been using it the past two years in Creation to the Greeks and Rome to the Reformation. We like it, but the kids also like less formal, more cartoonish drawing lessons, so I pulled together a list of pages from Draw Write Now and Draw and Write Through History (this and this) to go along with our history and science lessons, especially the science lessons. We're going to give Draw the USA a shot since it looks like fun and is supposed to be a really good way to learn geography. 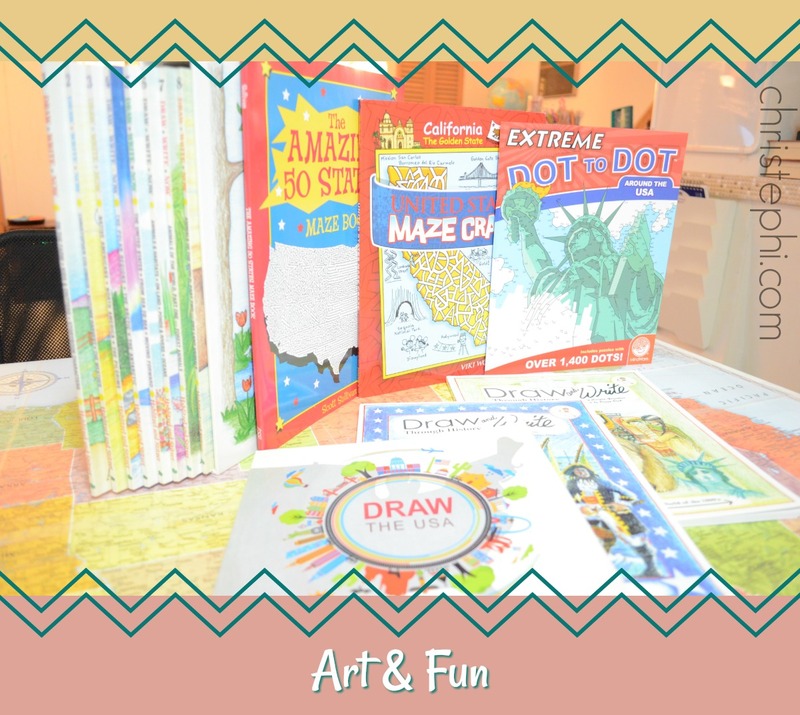 I also snagged some dot-to-dot and maze books (here and here) to keep little hands busy while little ears are busy. 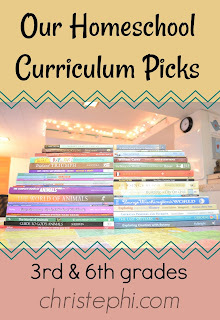 I think the only other thing I have on deck for this year that I haven't mentioned is a compilation of critical thinking exercises for Miss M. I pulled together pages from four different sources so she has one to do each day. She adores these things and they don't take too long, so I made the effort to get them all prepped and ready for her beforehand. In the past I would copy one here or there for her, but without any true consistency; I think this will be much better!